When Kevin Rudd first swept to power in 2007 there was talk that the Rudd era would stretch for a decade. In early 2010, opinion polls suggested he was Australia's most popular prime minister for three decades. But controversies over a shelved emissions-trading scheme and an unpopular mining tax caused his support to fall, and his Labor party moved against him. His deputy, Julia Gillard, challenged him for the leadership and won. The move, however, sparked a public backlash. Out of office, Mr Rudd remained a thorn in the side of Ms Gillard, consistently polling higher than her. In June 2013, with an election looming and support for Labor plummeting, his backers called for a return to avoid defeat. Mr Rudd won a leadership challenge and returned to lead his party into the vote. As support for Labor rose, he set a 7 September election date, but the gap with the Tony Abbott-led Liberal-National coalition then widened again. On election day, voters backed the opposition and ejected Mr Rudd from office. Two months later, he resigned from politics. Kevin Michael Rudd was born in September 1957 in the coastal hinterland north of Brisbane. His father, a farmer, died when Mr Rudd was 11 years old. Apparently facing eviction from the farm and with nowhere else to go, his mother, Margaret, was forced to sleep overnight in a car with two of her four young children. Four years later, Mr Rudd joined the Australian Labor Party, his family's experience of hardship having partly contributed to the decision. As a student, he studied Chinese language and history at the Australian National University, from where he joined the foreign service, serving as a diplomat in Sweden and China. But in 1988 he decided to change paths and became the chief of staff to the Labor premier in Queensland. Ten years later, after carving out a reputation as a competent if slightly humourless technocrat - colleagues nicknamed him Dr Death - he won election to parliament for the Queensland seat of Griffith. He harboured prime ministerial ambitions when he first arrived in Canberra, but it would be eight years before he became Labor leader, after impressing colleagues with his performance as shadow minister for foreign affairs. A committed Christian with a neat turn in sound-bites, he seemed particularly well-equipped to appeal to the suburban swing voters who tend to decide Australian elections. So in December 2006 he won the leadership, despite not having many close friends in the Labor caucus and little personal following. In 2007, Mr Rudd led Labor to a landslide election victory against the Liberal government. During his first premiership he was much more popular with the Australian people than with his colleagues in the Labor party. Correspondents say there were concerns about his style of leadership - his aloofness from colleagues and what many viewed as intellectual arrogance. But whatever his personal failings, Mr Rudd's legacy as prime minister was far-reaching. He withdrew Australian troops from Iraq and stood firm in his country's commitment to Afghanistan. He signed the Kyoto climate pact, and worked to reform health, education and controversial labour laws introduced by his predecessor, John Howard. But then his administration faltered. Having described global warming as "the greatest moral challenge of our time", Mr Rudd saw his popularity nose-dive when he decided to shelve the centrepiece of his environmental strategy, an emissions-trading scheme. His approval rating was further damaged when he decided to target the mining sector with a "super tax" on their profits. The Labor party powerbrokers decided to move against him. His deputy, Julia Gillard, challenged for the leadership and Mr Rudd was ousted in June 2010. Mr Rudd, however, was soon back in the cabinet as foreign minister, amid a backlash against Ms Gillard over the manner in which he was removed. The two worked side by side for 17 months. But as Ms Gillard's poll figures fell, talk of a leadership challenge emerged. When a vote was called in February 2012, Mr Rudd contested the ballot but was defeated by 71 votes to 31. That was not the end of the leadership speculation, however. Early in 2013, Ms Gillard set an election date of 14 September. As polling showed Labor on course for a resounding defeat, the rumbling began again. 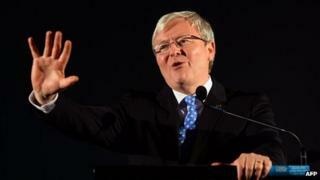 Mr Rudd declined to contest a leadership ballot in March, saying he did not have the numbers. But by June, public support for Ms Gillard had fallen even further. Another ballot was called and Mr Rudd won. Labor politicians looked to Mr Rudd to prevent a whitewash in the election. In the weeks leading up to the polls, he overhauled asylum and climate policy, and initially support for Labor rose significantly. But then it fell again, and on election day Mr Abbott's Liberal-National coalition swept Labor from office. "I know that Labor hearts are heavy across the nation tonight. I gave it my all. But it was not enough to win," he said, and stepped down from the party leadership. Just over two months later, he resigned from politics. "To have served as prime minister of Australia has been a great honour afforded to very few in our country's history," he said. "The prime ministership of this Commonwealth is not easy; it is the hardest job in the land."